The new academic session of Delhi University has just begun and Vodafone India has rolled an amazing offer for all students of Delhi NCR. Vodafone has introduced Campus Survival Kit offering a prepaid sim card that will give up to 1GB /day data & unlimited calling along with a booklet of Value for Money hacks and offers & a trendy messenger bag. The Vodafone Student Pack or Campus Survival Kit is priced at Rs. 445 (FRC) and it offers Unlimited Local & STD calls for 84 day along with 1 GB data per day. After 84 days, Vodafone Student Pack can be further extended by recharging with Rs. 352 and it will offer similar benefits. How to get Vodafone Student Pack in Delhi NCR? 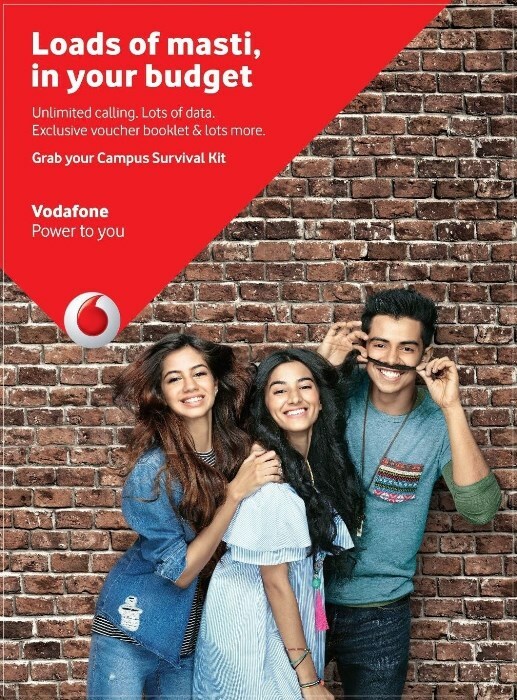 If you want to grab the latest Vodafone Student Pack in Delhi NCR, all you need to do is visit Vodafone India store with your College ID (List of Colleges mentioned below) and you can take up the Vodafone Student Pack for Rs. 445. Once the 445 Pack initial validity (84 days) is expired, you can recharge with Rs. 352 and continue to enjoy the same benefits again for 84 days. The Vodafone Student Pack is even cheaper than the Reliance Jio 399 Plan that offer Unlimited Calls & Data for 84 days. Vodafone might update the list of colleges/university eligible for this pack. We will also update the list here as & when new colleges are added to the list.